File: A home known as the John and Dorothy Haynes House, 3901 N. Washington Road, was designed by Frank Lloyd Wright and received local historic status in 2008. 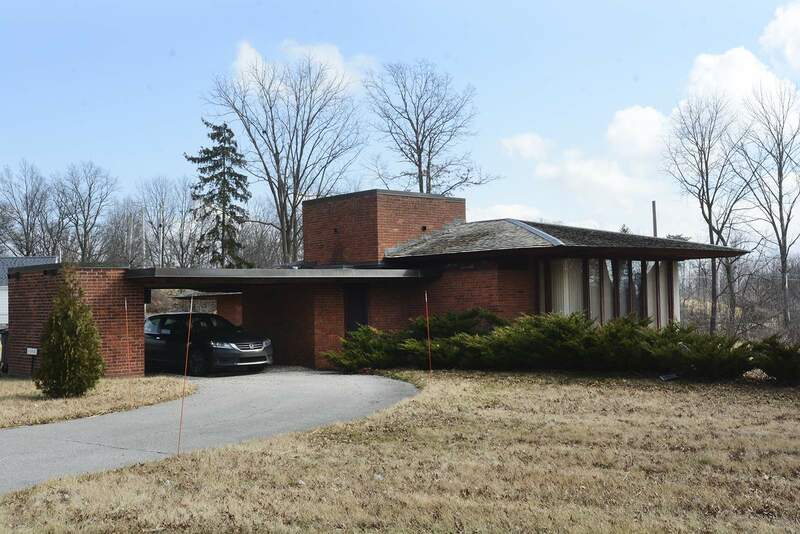 The latest chapter in the saga of northeast Indiana’s only home designed by renowned architect Frank Lloyd Wright will have to wait until next week for a resolution. In a 6-1 vote Tuesday, the Fort Wayne City Council gave no recommendation on a request to remove a "local historic district" designation from a home at 3901 N. Washington Road. The owner of the home, Richard Herber, petitioned the council for removal, citing exorbitant costs and a disability as reasons why he believed the designation should be taken off his home. The council will take the matter up again at its regular session meeting next week. Herber bought the house in 2004, and he requested and received the local historic district designation in 2008. Herber said he requested the designation to save the home from being demolished during a planned widening of Ardmore Avenue. Herber requested that the designation be removed once before, in 2010, but was denied. Herber claims his neighborhood is "under siege" from commercial development and that he has plans to move that are being hindered by the designation. Herber said Realtors have told him that "headaches" associated with the designation will drive buyers away. "The city got everything they wanted. They got Hillegas Road, they got the Ardmore (Avenue) truck expansion. The commercial speculators are getting what they want," Herber said. "Now I want what I need so I can move on." The home, also known as the John and Dorothy Haynes House, is a one-story house built in 1952 of brick, concrete, glass and wood. It sits on a 4-inch-thick concrete slab tinted brick red. It is an example of Wright’s Usonian designs. Herber said he was coerced into requesting the designation in the first place by the city’s Historic Preservation Commission and had no idea what he was getting into when he signed the paperwork. Don Orban, planner for the Historic Preservation Commission, and Colleen Huddleson, the commission’s chair, deny that. They said the commission did its best to make Herber aware of the rules that govern properties in historic districts. "Numerous emails document the correspondence from the beginning. (Herber) was referred to all of the guidelines that come along with being a property owner in a local historic district. That was numerous times he was given that information," Orban said. "He knew fully at the time he applied what he was coming into." Additionally, Orban and Huddleson said Herber has never come to the Historic Preservation Commission with any request to modify the home. Orban noted that the commission has accommodated issues for disabled homeowners in the past. Orban said historic districts are set up to protect historic homes but are not "intended to freeze anything at any given point in time." "I feel like there’s been accusations of things we’ve done that simply aren’t true," Huddleson said. "We very rarely deny applications (for modifications) quite frankly because we want people to live in these houses. We’re advocates for urban revitalization, for people living and working downtown." Huddleson said she thinks much of the dispute can be chalked up to miscommunication; she said she wishes that Herber would "just work with us." Eight community members, including other owners of historic properties, two former City Council members and Allen County Prosecutor Karen Richards, in her capacity as president of the ARCH board of directors, spoke out against removing the designation. ARCH’s mission is to preserve historic architecture in the Fort Wayne area. Former City Councilman John Shoaff, who is an architect, said he lived in the home for 27 years. He too is opposed to removing the designation and strongly urged the council to maintain the designation. "It was a great house for me as a bachelor. … It is a small house, and my wife and I outgrew it, so we sold it. It was the right thing to do," Shoaff said. "You can get a premium for these houses if they’re in good shape. I could have bought a house of the same size in a similar neighborhood and put money in the bank when I sold it. It’s the right thing to do." The council will consider whether to approve or deny Herber’s request at its meeting on Tuesday. Six votes are needed for approval.